Noatum Logistics, the Noatum Maritime division specialising in logistics, international transport and customs, has signed a definitive agreement to acquire MIQ Logistics, which is based in the USA and has 60 plus offices in 19 countries. The agreement is expected to close in the coming weeks. Once the agreement has been concluded, Noatum Logistics will have made a strategic leap as one of the world’s leading companies in its field, contributing greater added value to the logistics chain of all clients. Read more. 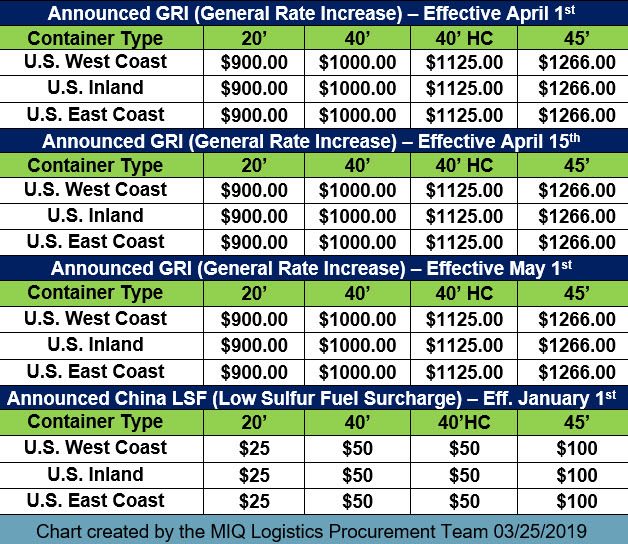 On Wednesday, March 20, 2019, the United States Trade Representative (USTR) office released a second Notice of Product Exclusions to the Section 301 List 1 products currently subject to a 25% tariff. Read more. International transportation continues to be impacted by the India – Pakistan conflict. Read what the MIQ India team has shared in this Supply Chain Alert. Read more. In a press release dated March 4, 2019, the Office of the United States Trade Representative (USTR) announced “the United States intends to terminate India’s and Turkey’s designation as beneficiary developing countries under the Generalized System of Preferences (GSP) program because they no longer comply with the statutory eligibility criteria.” Read more. 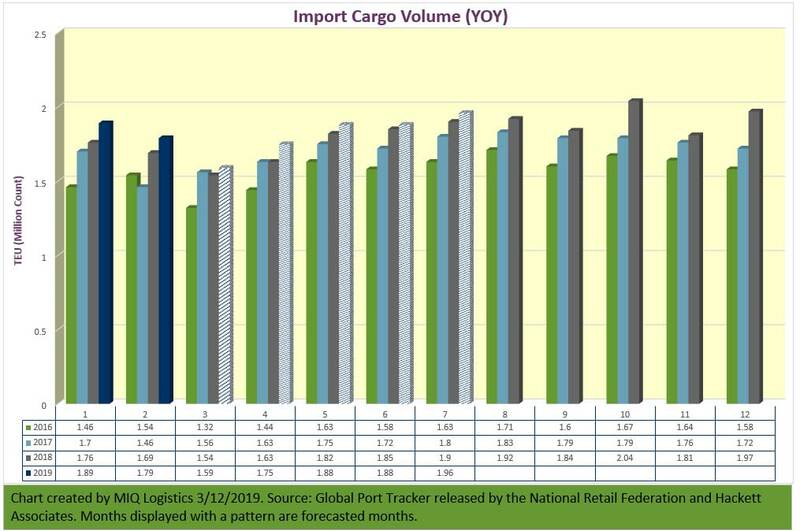 With the retail industry in its annual lull between seasons and plans for a tariff increase on hold, imports at the nation’s major retail container ports are expected to drop to their lowest level in almost a year this month, according to the monthly Global Port Tracker report released today by the National Retail Federation and Hackett Associates. Read more. 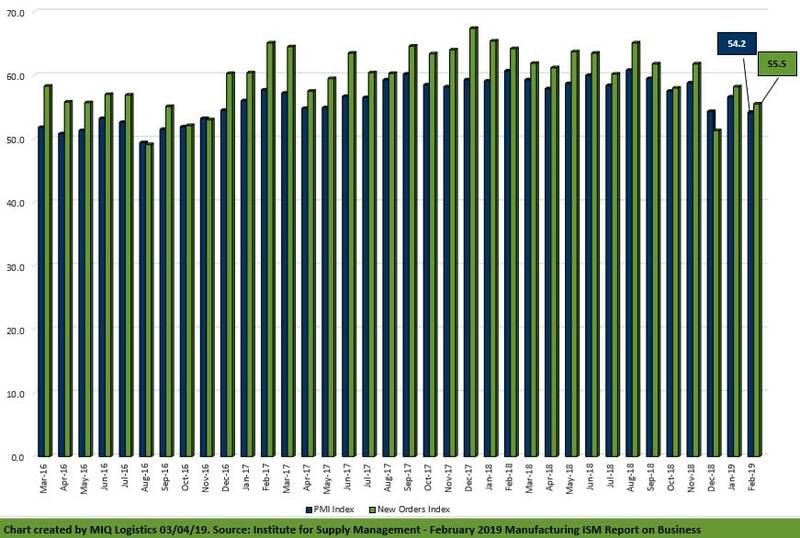 Economic activity in the manufacturing sector expanded in February, and the overall economy grew for the 118th consecutive month, say the nation’s supply executives in the latest Manufacturing ISM Report On Business. Read more.